Splashing around in a pool is a fantastic way to cool off with your family, but there is a risk to having a backyard pool. As the Centers for Disease Control notes, every day about 10 people die from drowning, and about two are kids ages 14 or younger. Granted, some of these drowning occur in lakes, oceans and other bodies of water, but the fact remains that parents must be extremely vigilant and take steps to ensure the family pool is safe. Invest in a pool fence for an extra layer of safety between curious kids and the water. In addition, be sure that the pool gate is closed and locked whenever the pool is not in use. You may also wish to invest in a pool alarm that will let you know with a shrill shriek if one of your kids or pets has fallen into the water. Visit Poolcenter.com to find a wide range of pool safety equipment. Jumping on a trampoline is a great way to get exercise, but it can also cause strains, fractures and other injuries. To make sure your trampoline is as safe as possible, be sure it’s placed on level ground, far from trees, swing sets and other hazards. 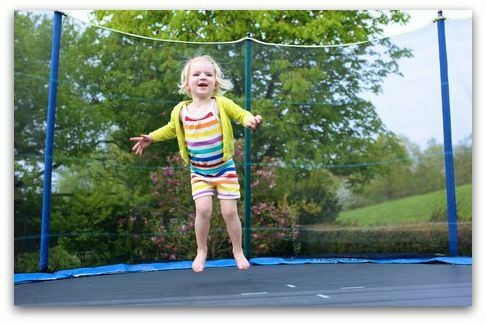 Install a safety net around the entire trampoline, which will help prevent kids from flying off and landing on the hard ground. Cover the frame and springs with shock-absorbing pads. Also, do not allow your kids to jump unsupervised; make sure an adult or trusted teenager is with them at all times, and don’t let your kids get too fancy with their somersaults and other risky moves. JumpSport.com carries safety gear for trampolines. It’s wonderful to gather around a fire pit on a chilly night and toast marshmallows with the kids. Of course, you have to be cautious with the fire pit both while it’s going and afterwards. Make sure it’s at least 10 feet away from the house or anything else combustible, and only light it on nights when the wind is calm. Keep a full bucket of water nearby and keep a close eye on young kids to be sure they do not venture near the pit. Don’t allow kids to play tag or run around anywhere near the fire pit, and if your pets are too curious around fire, keep them indoors. When it comes time to extinguishing the fire, take the ashes and spread them over a larger area inside the pit and then gently pour the water over the ashes. Then before going to bed, stir the ashes with a stick to make sure they are fully extinguished. FirePlaceMall.com has more essential fire pit safety tips.